We perform virus scan on both initial publish and subsequent update of an extension so that you aren’t getting malware from Marketplace. This also includes checking for npm and other dependent packages for known vulnerabilities like this. We perform content scan on both initial publish and subsequent update of an extension so that you aren’t getting adult, offensive, CSAM (child sexual abuse material) and terrorist content from Marketplace. Before a publisher can publicly list an Azure DevOps extension in Marketplace, we need to verify them. This requires that they send an email to us from their account and state their social presence (linkedin, twitter, github, organization etc.). This way we know them a little better and also get to understand that it is not a bot publishing an extension. Apart from the above, we also rely on the community to bubble up quality extensions and report the ones that seem suspicious. We have Q&A and Ratings on each extension so that you can engage with an extension’s publisher(s) and have a meaningful dialogue. You can also use this Q&A capability to understand the software development life cycle practices the publisher follows, their test matrix and exit criteria. Do see what others are asking and if the publisher responds to them soon and in a meaningful way. Extensions should continue working after the sprintly Azure DevOps deployments and TFS upgrade since we maintain backward compatibility for all APIs that an extension can call. Any data stored by the extension (in a service provided by Azure DevOps and TFS) is not touched during these deployments/upgraded. If you still have concerns with security, we recommend you install the extension on an isolated organization first to rest your concerns. This can be an internal test organization. After you’re satisfied with your testing, you can proceed to install the extension on your production organization. If you see compatibility issues after an update of the extension, please reach out to the publisher and report the same. Hope all this information was helpful. Please reach out to vsmarketplace at microsoft dot com in case you have any more questions! If you see a suspicious extension on Marketplace, do report it to us at vsmarketplace at microsoft dot com. 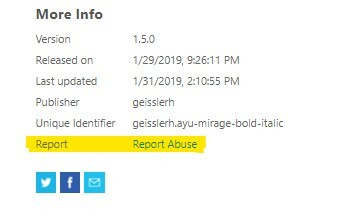 You can also use the ‘Report Abuse’ link on the extensions details page to email us.